↑ German National Library, Berlin State Library, Bavarian State Library et al. Record #118644181 // Gemeinsame Normdatei — 2012—2016. ↑ Schimmel, Annemarie (2004) The Empire of the Great Mughals: History, Art, and Culture Reaktion Books. p. 88. ↑ Elgood, Robert (1995) Firearms of the Islamic World I.B.Tauris. p. 135. ↑ Gommans, Jos (2002). Mughal Warfare: Indian Frontiers and High Roads to Empire, 1500-1700 Routledge. p. 134. ↑ 12,0 12,1 Eraly, Abraham (2000). Emperors of the Peacock Throne: The Saga of the Great Mughals. Penguin Books India. pp. 118–124. ↑ Richards, John F. (1996). The Mughal Empire. Cambridge University Press. pp. 9–13. ↑ Richards, John F. (1996). The Mughal Empire. Cambridge University Press. pp. 14–15. ↑ Chandra, Satish (2005). 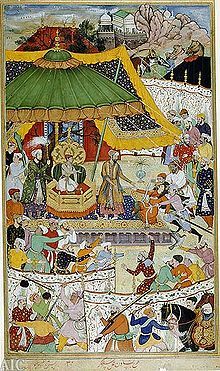 Medieval India: From Sultanat to the Mughals Part - II. Har-Anand Publications. pp. 105–106. ↑ Chandra, Dr. Satish (2001). Medieval India: From Sultanat to the Mughals. Har Anand Publications. p. 107. ↑ Eraly, Abraham (2000). Emperors of the Peacock Throne: The Saga of the Great Mughals. Penguin Books India. pp. 143–147. ↑ Dani, Ahmad Hasan Dani; Chahryar Adle; Irfan Habib (2002). History of Civilizations of Central Asia: Development in Contrast: From the Sixteenth to the Mid-Nineteenth Century. UNESCO. pp. 276–277. ↑ Richards, John F. (1996). [ https://books.google.am/books?id=HHyVh29gy4QC&pg=PA49&hl=hy#v=onepage&q&f=false The Mughal Empire]. Cambridge University Press. pp. 49–51. ↑ Eraly, Abraham (2000). Emperors of the Peacock Throne: The Saga of the Great Mughals. Penguin Books India. pp. 156–157. ↑ Mehta, J.L. (2000). Advanced Study In The History Of Medieval India. Sterling Publishers. p. 258. ↑ Floor, Willem; Edmund Herzig (2012). Iran and the World in the Safavid Age. I.B.Tauris. p. 136. Ali, M. Athar (2006). Mughal India: Studies in Polity, Ideas, Society and Culture. Oxford University Press. ISBN 978-0-19-569661-5. Chandra, Satish (2007). History of Medieval India. New Delhi: Orient Longman. ISBN 978-81-250-3226-7. Habib, Irfan (1997). Akbar and His India. New Delhi: Oxford University Press. ISBN 978-0-19-563791-5. Hasan, Nurul (2007). Religion, State and Society in Medieval India. New Delhi: Oxford University Press. ISBN 978-0-19-569660-8. Moosvi, Shireen (2008). People, Taxation and Trade in Mughal India. New Delhi: Oxford University Press. ISBN 978-0-19-569315-7. Nath, R. (1982). History of Mughal Architecture. Abhinav Publications. ISBN 978-81-7017-159-1. Sangari, Kumkum (2007). "Akbar: The Name of a Conjuncture". In Grewal, J.S. The State and Society in Medieval India. New Delhi: Oxford University Press. pp. 475–501. ISBN 978-0-19-566720-2. Sarkar, Jadunath (1984). [ https://books.google.am/books?id=O0oPIo9TXKcC&hl=hy A History of Jaipur]. New Delhi: Orient Longman. ISBN 81-250-0333-9. Smith, Vincent Arthur (1917). Akbar the Great Mogul, 1542-1605. Oxford at The Clarendon Press. Smith, Vincent A. (2002). The Oxford History of India. Oxford University Press. ISBN 978-0-19-561297-4. Augustus, Frederick; (tr. by Annette Susannah Beveridge) (1890). The Emperor Akbar, a contribution towards the history of India in the 16th century (Vol. 1). Thacker, Spink and Co., Calcutta. Augustus, Frederick; (tr. by Annette Susannah Beveridge) (1890). Gustav von Buchwald, ed. The Emperor Akbar, a contribution towards the history of India in the 16th century (Vol. 2). Thacker, Spink and Co., Calcutta. Malleson, Colonel G. B. (1899) Rulers of India series. Oxford at the Clarendon Press. Garbe, Dr. Richard von (1909). Akbar - Emperor of India. A Picture of Life and Customs from the Sixteenth Century. The Opencourt Publishing Company, Chicago. The History of Aryan Rule In India from the earliest times to the death of Akbar. Frederick A. Stokes Co., New York. Moreland, W. H. (1920). India at the death of Akbar: An economic study. Macmillan & Co., London. Monserrate, Father Antonio (1922). The commentary of Father Monserrate, S.J., on his journey to the court of Akbar. Oxford University Press.